DUOMATIC axle is a planetary transmission that can be shifted easily and permits dropping down to lower speed when more power is needed. 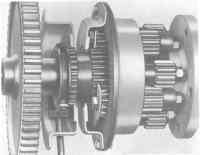 Power divided equally to both drive wheels by a 8 pinion gear differential. 100% free wheeling, easy to maneuver. 7 Horses that work--instead of you! Take control of the plastic handle grips, flick the control with your finger -- and seven horses go to work for you, harnessed and anxious to do your bidding. Saving you the tremendous energy they provide for tough jobs. No fair weather friend, Simplicity's Model VB helps with the big jobs all year 'round -- whether it be grass cutting . . . rolling lawns . . . pulling heavy loads . . . plowing, harrowing or tilling . . . dumping refuse . 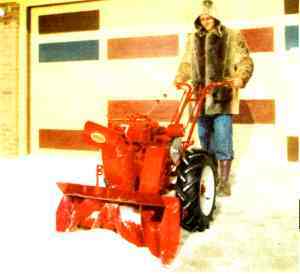 . . or removing snow. So versatile it can handle the 28" tiller in toughest ground in all speeds. Your Model VB is ready, willing and able to give you peak performance in August heat or January cold. Depend on it for trouble-free service -- for that's the kind it gives.